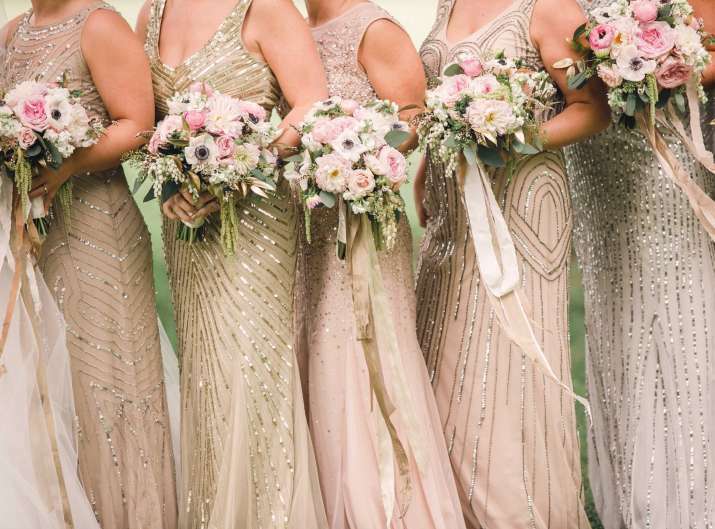 Set new trends this wedding season with shimmery and metallic fashion choices. Here, we have listed some trends that can make you look gorgeous and trendy this wedding season! 1. Shimmer and metallic looks in Indo-western saris: With the new age definition of saris with waistband (metallic belt) and leggings attached, the metallic looks are a perfect combination of elegance with style. This style is trending these days and can be seen majorly in wedding functions a lot. 2. Shimmer and metallic looks for Indo-western gowns: Metallic Indo-western gowns are trending these days. Metallic and shimmer in Indo-western gowns make a splendid combination, with a hint of sequins or patch work combined with metallic borders or silhouette. 3. Shimmer and metallic footwear: The metallic footwear for wedding season goes extremely well even if they are carried with non-metallic outfits. The metallic footwear is very appealing and can be paired with almost all kinds of wedding ensembles as they can look well matched with everything. 4. Shimmer and metallic clutches: They can be matched with every type of wedding ensemble and can be paired with even non-metallic looks. The shimmer and metallic clutches are a perfect option for all kind of wedding functions with their mass appeal. 5. Shimmer and metal make-up styles: The metallic make-up looks are the latest addition to the smokey eyes with a hint of glitter added, these looks are absolute must for wedding season. The metallic make-up looks are also trending these days in terms of the massive highlighter trend.